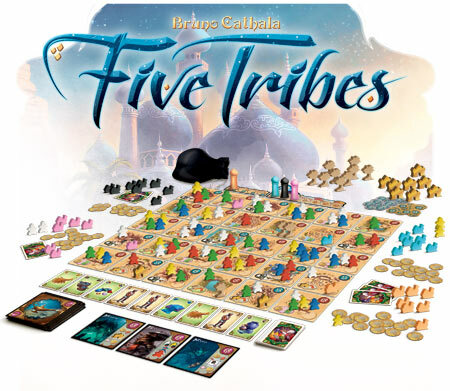 Days of Wonder has released Five Tribes , which debuted at Gen Con. The game builds on the tradition of German-style games. The game twists the “worker placement” genre, starting with the pieces already on the board. Players mus maneuver them through villages, markerts, oasis, and sacred places that make up Nagala. How, when, and where you dis-place these Five Tribes of Assassins, Elders, Builders, Merchants, and Viziers determine your victory or failure. The game features 30 tiles depicted the Sultanate of Nagala, 22 Djinn, and 54 Resource cards. It also has over 100 wooden pieces, which includes 90 meeple which represent the 5 tribes. There’s also palm trees and palaces. The game is designed for 2 to 4 players age 13+. Games should run between 40-80 minutes.